Times were mostly bleak for Cornhusker football between the Rose Bowl season of 1940 and Bob Devaney's arrival in 1962. But Nebraska did enjoy three winning seasons. The coach all three times: J. William Glassford. Glassford arrived in Lincoln in 1949 after a three-year stint at New Hampshire in which he compiled a 19-5-1 record. In his seven seasons at Nebraska, his teams went 31-35-3, and he coached three All-Americans: Tom Novak, Bobby Reynolds and Jerry Minnick. It was his 1950 team that stood out, as senior quarterback Fran Nagle and sophomore halfback Reynolds led an explosive offense that regularly brought fans to their feet. Known for his exceptionally tough practices and iron discipline, he sparked a player rebellion after the 1953 season, with about three dozen team members signing petitions demanding his resignation. Thanks largely to a contract clause that made it nearly impossible for the school to dismiss him, he weathered that storm, and relations with players improved markedly. Glassford's 1954 squad would become just the second bowl team in NU history, representing the Big Seven in the Orange Bowl. (A conference rule prohibited Big Seven champion Oklahoma from going in consecutive years.) 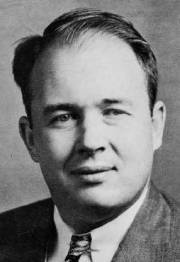 Glassford resigned after the 1955 season and became an insurance executive in Phoenix. A guard and team captain at Pitt, Glassford was selected in the fourth round of the 1937 NFL draft by the Detroit Lions. He was inducted into the Nebraska Football Hall of Fame in 2003, an occasion that drew him to Memorial Stadium for the first time since 1980. He lives in Cedaredge, Colo.